New Living Thelema Podcast Posted – Zero Equals Two! “This episode is on Scrying the Enochian Aethyrs. I discuss the utility of the visionary process overall and describe some of the results of my own scrying as presented in my book The Winds of Wisdom. Finally, I give a presentation of the basic methods you can use to try scrying the Aethyrs yourself. 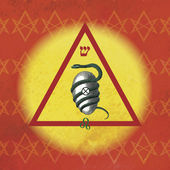 All Living Thelema episodes are archived at http://livingthelema.com/category/podcast/ and you can also subscribe via iTunes, Feedburner, or the podcast software of your choice.